i'm reading escaping into the open by elizabeth berg. i know many of you have read anne lamott, and she's next on my list, because i love reading about writing. escaping into the open is lighthearted and very inspiring, i don't really want it to end. but as i mentioned before, i cannot knit and read at the same time. so what i have been doing in the evenings is watching TED talks while knitting. they are intriguing, and have just the right length to keep me focused. two that i have especially enjoyed are this one by amy cuddy and this one by amy webb (both of them being "amy" is just a funny coincidence!). now it's your turn! what are you knitting and reading? i look forward to browsing your blogs! joining ginny again this week. P.S. : our newsletter is coming soon! click here to subscribe! Your shawl is so pretty Sylvia, I love stripes. I will have to check out Elizabeth Berg, I haven't read her. I need to get that book, thanks for the recommendation :) I started a color affection (my second one) and I do love seeing yours in progress. I love that shawl, it's been on my 'to knit' list for a while! I love the green in your Color Affection! The book I'm reading now (Knitting Yarns) features a short story by Elizabeth Berg. I'm looking forward to getting to it. I remember as I got to the end of that shawl that it felt like it was taking forever! It really does look nice - you can see the progress. Hang in there! Wonderful shawl! I have read all of E. Berg's books. This must be new? is this a new elizabeth berg? i've read many of hers and always enjoy, but don't remember this one! 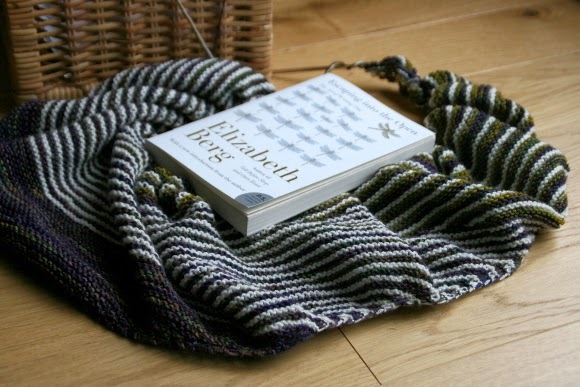 Love the shawl….stripes!!! My favorite! Oh, I love TED Talk suggestions - I've been listening to two-year-old podcasts when I knit in the evening! I have a color affection on the needles, too. I love it. Very spiffy shawl! And is this a new Elizabeth Berg? I've read most all of hers, but not this one. Thanks for the heads up! I love TED talks! And I also love how much progress your shawl is making! I love the colors of your shawl. Beautiful.